Killing cockroaches is a nasty business. Not only are the creatures themselves irritating in your home, most traditional roach repellents are full of toxic chemicals. Traditional pest control products have been linked to certain types of cancer and a host of side effects. A quick read of the warning label shows that these traditional roach killers can be toxic for human and animal health. They can also cause dizziness, nausea, and lightheadedness. Fortunately, there are several natural ways to get rid of a cockroach infestation fast. We've put together a list of the best ways to eliminate roaches in your home without using toxic chemicals. From roach traps to preventative measures, we've got you covered. A simple and effective roach killer is a combination of sugar and baking soda. The sugar attracts the cockroaches while the baking soda eliminates them. The baking soda mixes with the stomach acid of roaches, causing them to die slowly over time. Mix equal parts baking soda and sugar in a bottle. Sprinkle the mixture anywhere you see roaches and at suspected entry points to your home. One of the best ways to eliminate roaches in your home is to prevent them from entering in the first place. Bay leaves are a natural roach repellent since cockroaches don't like the smell of the leaves. A bay leaf is non-toxic so you don't have to worry about your pets or young children eating it. Take a handful of bay leaves and crush them using a mortar and pestle. Sprinkle the powder in roach nests and anywhere you may have already seen the roaches. Another alternative is cucumbers. Roaches naturally avoid this healthy vegetable so set a few pieces out where you think the roaches enter your home. You can also use cucumber peels for a less messy way of dealing with your roach problem. Boric acid may not be the healthiest alternative, but it is one of the most effective when it comes to roach killer. Boric acid is toxic and classified as a poison for humans and animals. It's naturally derived, but should be kept away from pets and family members. You only need a light dusting of this potent powder to be effective. The powder must also remain dry, otherwise it won't kill the roaches. The roaches walk on the boric acid and then lick it off during grooming. The poison enters their system and kills the roaches quickly and efficiently. While toxic, boric acid is a good choice for people with serious or tough infestations. Lemon juice is one of the most effective home remedies for a cockroach infestation. Lemons are already associated with a clean home and using these citrus fruits to clean floors and entry points will deter roaches. Simply wash your floors, countertops, and other surfaces with equal parts lemon juice and water. Make sure to hit high traffic areas and any previously infested areas. You can also spray it in any potential roach water sources to keep them from moving in. This natural remedy involves spraying the roaches as soon as you see them. Combine three parts fabric softener with two parts water in a large spray bottle. Shake the bottle before spraying and aim the mixture directly at the roaches. Cockroaches breathe through their skin so when they are covered with this natural liquid, they suffocate and die. You can also use dish soap instead of fabric softener, but the fabric softener tends to work better. This method is perfect for people who have a lot of cockroaches that skitter across the floor and are difficult to target. Coffee grounds can be used to make roach traps. Like sugar, cockroaches are naturally attracted to coffee grounds. All you need to do is fill a jar with coffee grounds and water. It will take anywhere from 30 to 40 minutes for the roaches to drown in the water and coffee mixture so keeping them inside is essential. Leave enough room at the top of the jar to prevent the roaches from climbing out of the container. Grease the inside of the jar with petroleum jelly so the surface is too slick for them to escape. Essential oils have a host of health benefits and can be used as a natural roach killer. Certain scents can also be used to deter roaches from entering your home to begin with. Peppermint oil, cypress oil, eucalyptus oil, and tea tree oil are among the most effective natural home remedies for roaches. Combine the essential oils with water or saltwater and spray around your home. Make sure to coat areas that are high traffic spots for roaches as well as entry points. Just like peppermint oil, Listerine is a natural roach repellent due to its scent. Mix equal parts of Listerine and dish soap in a spray bottle. This method is best for small infestations and won't actually kill the roaches unless you manage to spray them directly. Instead, Listerine spray is a good way to prevent future infestations and manage small existing ones. Diatomaceous earth is made of marine phytoplankton, which is toxic to cockroaches. Buy the food-grade variety and scatter the powder in cabinets, on floors, and in places where you frequently see roaches. Make sure to remove the dead roaches and clean the area using lemon to prevent future infestations. Cayenne pepper can be added to roach bait to kill the invaders. The spice can also be sprinkled by itself since it is a natural roach deterrent. Cayenne pepper may also be effective in eliminating bed bugs and other insects. The life cycle of a cockroach can last anywhere from six months to one year. American cockroaches live for approximately one year while German cockroaches live only about 100 days. 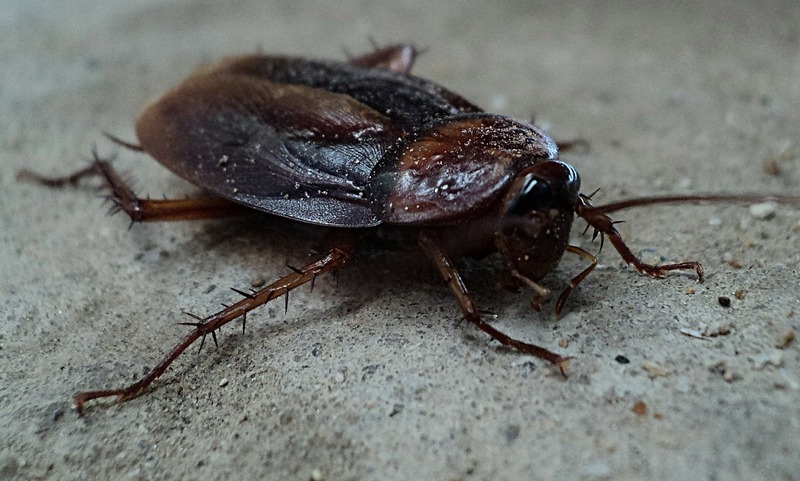 Whichever type of cockroach you're dealing with, eliminating them can take time. Use a combination of these natural remedies to both deter and kill and invading roaches. Since they don’t contain toxic chemicals, you can rest easy knowing that you're getting rid of the pests the natural way.